This skill-building beginner's guide reveals the secrets of capturing humor and expression in caricature carving. 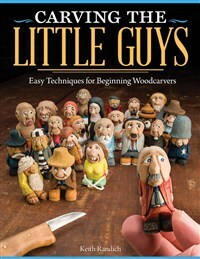 Learn to transform small blocks of wood into expressive little people with illustrated cut-by-cut instructions. Basic information is included on wood, tools, sharpening, cutting, safety, finishing, repairs, and more. Keith Randich is the Information Technology Director for the city of Atlantic Beach, Florida, but in his spare time likes to carve wood. He has published several books including Old Time Whittling and Carving the Little Sailors, and has written and been featured in many popular woodcarving magazines such as Wood Magazine, Popular Woodworking, Woodcarving Magazine, Weekend Woodworker, and The Router Magazine.